A haku lei is a head lei usually reserved for those special occasions such as luaus (parties), graduations, weddings, and ceremonies. The word “haku” refers to a technique of lei-making where the flowers and/or greenery is sewn/braided with the “face-out.” Banana or ti-leaves are usually the background material filled with a beautiful array of colorful flowers and local foliage. 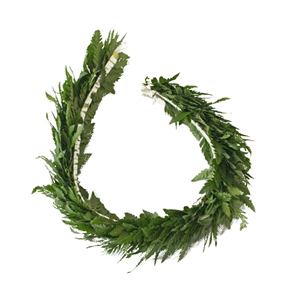 Our leather leaf fern is used in this headpiece to create a long lasting all-green haku. Very popular among hula performers (both male and female. )Tip: If you’d like a specific color or special flowers, see “custom haku.” Also, custom wristlets or anklets may be ordered to match. Care: Wrap a lightly damp paper towel around haku and place in plastic bag. Refrigerate.